Nigella Lawson is my favorite TV chef. Not just because she is pretty and has a cool accent, but because she’s hysterically funny and loves eating and sharing food. When I think of Nigella, I immediately think of cake, because it’s obvious she loves cake if you’ve read any of her cookbooks. But after cake, I think pasta. This is a woman who doesn’t worry about carbs or maintaining a gluten-free diet. She eats pasta with gusto. So I found a unique pasta on her website, Nigella.com, to celebrate pasta and Ms. Nigella Lawson. It was a pasta I’ve never come across before. This pasta recipe, called Pesto Trapanese, originates from the Italian city of Trapani, on Sicily’s westernmost tip. Geographically, Trapani is closer to the country of Tunisia so its local food has been defined by both Italian and Tunisian ingredients. As a result, this pesto bears no resemblance to the popular basil pesto with which we’re familiar from Liguria. Instead, it is a savory-sweet combination of tomatoes, raisins, and almonds with the addition of anchovies and capers. Intrigued? I was! Pappardelle are a beautiful pasta. 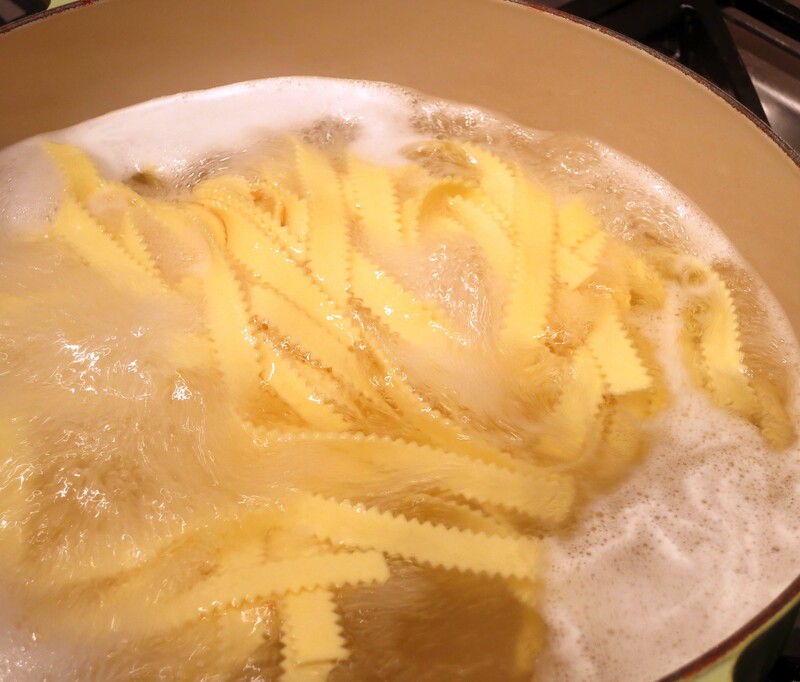 Cook your pasta according to package directions in salted water. 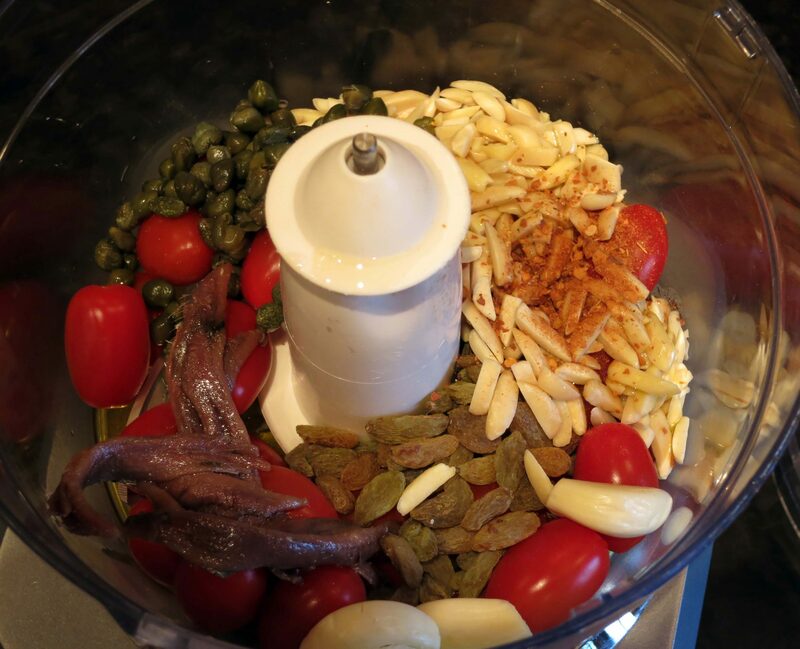 Meanwhile, place the tomatoes, anchovies, sultanas, garlic, capers and almonds in the jar of your food processor. Add the 2 ounces of oil and process until smooth. Ms. Lawson also recommends using about 2 tablespoons of the pasta cooking water in the pesto sauce. Without pasta water, mine looked like this, so I didn’t add any water. Drain the pasta, then put in a large serving bowl. 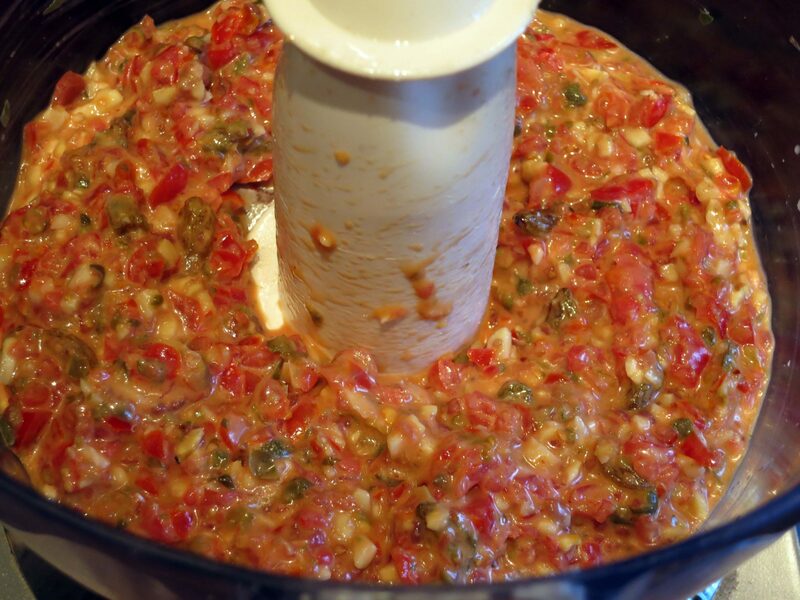 Immediately add the tomato mixture and stir to combine. Taste for seasoning. I added cayenne pepper flakes. 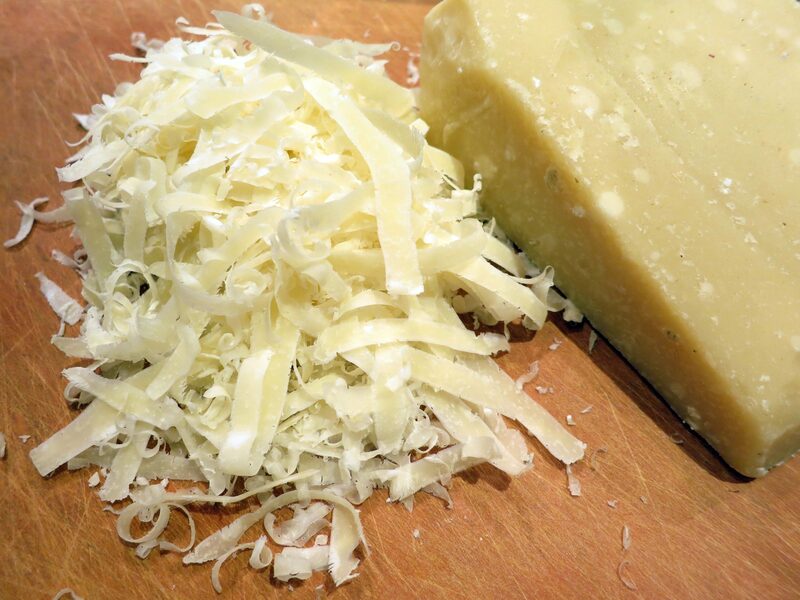 Serve with some grated Parmesan and a few basil leaves, if desired. “I have come across more than one version of “pesto Trapanese”, the Sicilian pasta sauce from Trapani that differs from the more popularly known Genoese variety in a number of ways. Chief of these is that almonds, not pine nuts, are ground into the mix – a divergence whose origins (in common with a lot of Sicilian food) owe much to Arabic cooking. I like to use fusilli lunghi, which are like long golden ringlets (or, less poetically, telephone cords) but, if you can’t find them, simply substitute regulation-size fusilli (or indeed any pasta of your choice). I love Nigella she is one of my favorites, I have made several of her pasta recipes and they are very good. Never saw this one before it also sounds fantastic. It’s quick and easy just how I like it. Thanks for sharing this, adding to my must try’s. I just came across it recently, and I’m glad I did! 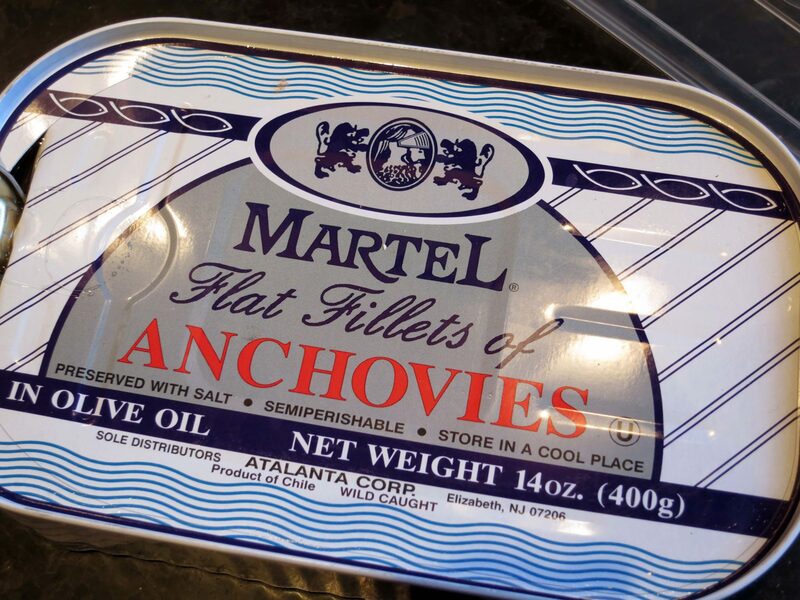 A great option for me to work on my dislike of anchovies… but slowly I am working to change that…. I am pinning this for sure! You don’t have to say anything….. It is so easy and unique! I haven’t had pasta in a while! I might have to give this one a go! Sounds delicious! I love anchovies cooked into a recipe. As a topping on pizza, not so much. I’ve tried eating them on their own (tapas style) a couple different times. Again, that didn’t work for me. But I love them in sauces and dressings! Thanks for sharing!! Hahaha! I don’t want to eat whole anchovies or sardines! I love Nigella too. This sounds like an interesting recipe, thanks for sharing. Nigella is a UK institution! She is the daughter of a famous politician and she lost a husband years ago to cancer (it was a sad thing) and remarried to an equally famous advertising guru (Sachi I think), We love her because she really does a theatrical thing on the tele – all pouting and purring while she sticks her head in the fridge. Mind you in the past year she’s lost loads of weight so I suspect she isn’t eating what she’s cooking! Satchi is a well known art collector I think… I only know this because my daughter works in antiques in London. Nigella will always be beautiful to me, no matter her weight! Nigella does love pasta, so I can only imagine this tasted awesome. I can hardly wait to try this..
You’ll have to tell me what you think! I have had pesto Trapanese on my to try list for some time. We follow a Sicilian TV detective series, “Montalbano” on which food features quite highly. This pasta sauce has been mentioned quite a few times. Thanks for providing the recipe. Oh, funny! It’s definitely worth trying! What an interesting (in a good way!) recipe. I like Nigella, too. Great post! It looks beautiful. You know how I feel about Nigella. She’s one of my food heroes and I got to speak to her via video chat.. That was so incredible. This recipe looks amazing! Good choice! btw the shaved cheese is so fancy! Hi Mimi, I’d emailed you the pasta badge etc for Forever Nigella but it bounced back undeliverable! Those zig zag pasta ribbons look wonderful, I must keep an eye out for some similar ones here. I figured you were busy. It’s ok! Ciao chef Mimi … I’m also a great fan of Nigella’s … and appreciate her desire to cut corners sometimes, for the sake of practicality and time, etc. not to mention inventiveness! To me she is a genuine, intuitive cook whose eye for detail is accompanied by a joyful and childlike desire to share, comfort, excite and delight. I am sure this recipe tastes absolutely marvellous so I am in no way criticising the dish. However, I do get a little upset when an Italian/regional recipe provided by a non-local misses the mark in terms of authenticity. The Pesto alla Trapanese (also called “agghiata trapanisa” – agghiata being a reference to ‘aglio’ or garlic) was probably indeed a Sicilian interpretation of the Genoese pesto — many Genoese ships would pass through the port at Trapani and probably showed the locals how they made pesto. And the locals converted the recipe using ingredients that were their own: almonds and tomatoes AND pecorino AND fresh basil leaves. But no anchovies, no, and no raisins either. Again, I don’t want to come over as being a frowning frumpy party-pooper commentator. I just like the idea that people should know about the real thing. How they then choose to reinterpret or add or subtract is eminently up to them! But also don’t you think that there are so many versions of this dish depe ding on the family, the neighborhood, the region, etc. I just don’t care. If I did, I would just google everything and sound like Wikipedia. The same “Authentic” and “traditional” dishes are different in everyone’s families for so many different reasons. And, Geography plays a huge part in food history. So you’re probably both right! Oh good! The pasta itself looks so interesting! 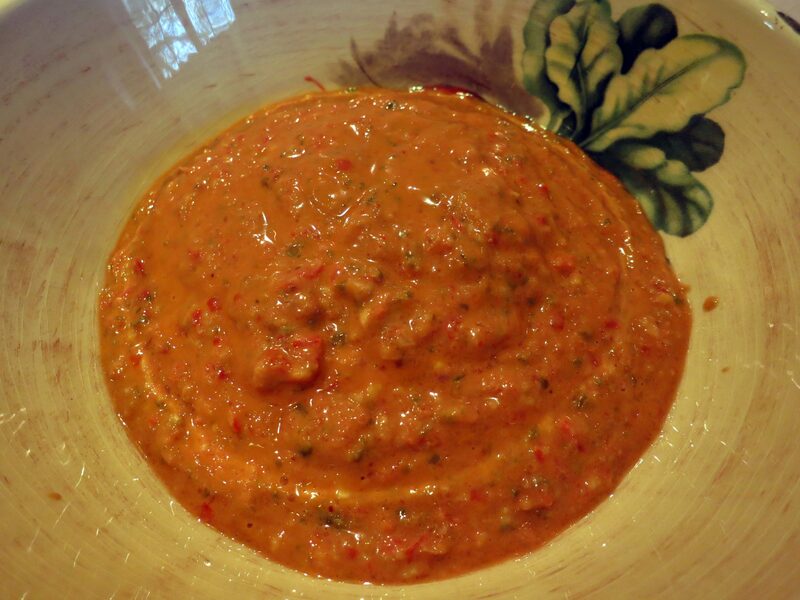 Try this sauce once, though – it doesn’t make much – and see what you think. I know you’re a purist when it comes to Italian cuisine, but this was so good! I’ve honestly never had a whopper or Big Mac, although I appreciate your analogy. Thing is, I don’t think that Big Macs change with neighborhoods, counties, towns, etc. but I think pastas are different wherever you are. Take Giuliani bugiali’s recipes – you seriously feel that the Italian food police are coming after you… if you don’t follow the recipe exactly! All I know is… it was fabulous! Yum! And I love Nigella too! How’s that baby of yours? These are the same reasons why I love Nigella! I love the bit at the end of the show where she goes back to the fridge at night to have a bit of a munch :) Your pasta looks beautiful! That’s my favorite part, too! It’s funny ow no one else gets that! Such unique and different recipe! 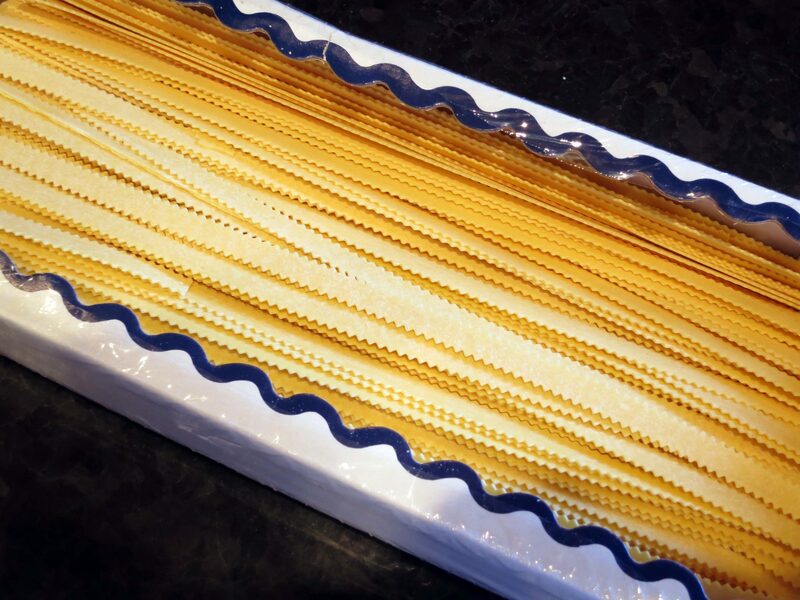 I will add it to my list of recipes to try… I mean I do LOVE pasta. I couldn’t believe how good it was ! We share the common love for Nigella Lawson! who wouldn’t love her! It seems that a few people are against her these days, but I have a feeling she’ll persevere! I know! I was and still am in disbelief! Maybe she took drugs a few times, but I refuse to believe that she was addicted! Drug addicts (for 10 yrs or so) can’t look like her.. She glows! She was called to testify in the court and now she’s being put on trial! How sad is that? Looks tasty, I love pasta so much! If you haven’t check it out already, Nigella’s written a book of Italian recipes, I’m sure you’d apprciate it. Yes! I got it as a Christmas present, actually! Love Nigella!